KTM are getting ready to attack the small-capacity adventure market with this 390cc offering. Don’t get too excited by the full car- bon fibre front subframe visible in the pictures though. This is from a 690 Rally Raid model and is unlikely to find its way onto the production bike. 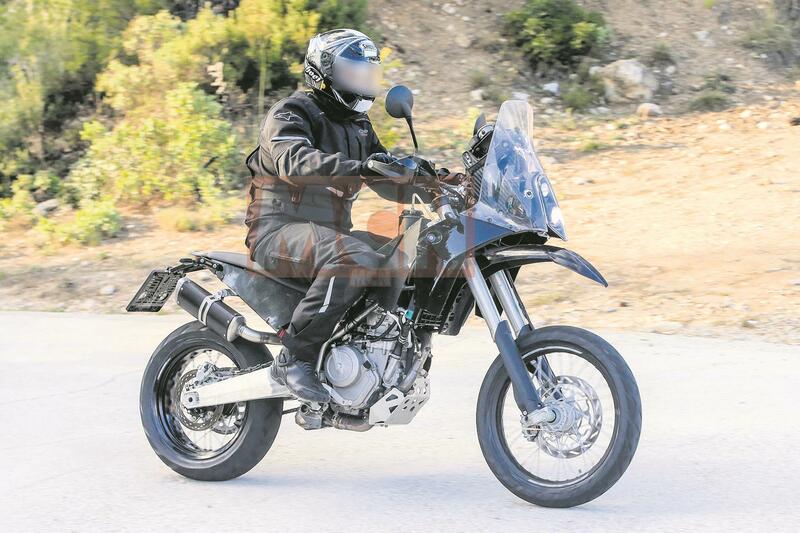 We expect this machine to have a similar cockpit to that seen on the 790 Adventure we revealed two weeks ago. The suspension appears to be the same WP forks as those used on the 690 Enduro and it also shares the same Brembo twin-piston caliper. The production bike is unlikely to share this level of spec, and we have seen this complete front end used on other test mules in the past, suggesting that it give the test team a known variable while developing chassis dynamics. The model in the photographs has a 19in front wheel and a 17in rear, rather than the 21/18 employed by the 690, indicating it has a heavier road bias. Some of the most interesting suspension developments are taking place at the rear of the bike. The swingarm is beefier than the one fitted to the 690, but nowhere near as chunky at the one on the 1290 Super Adventure. The shock has been offset too, which allows for easier access while reducing its exposure to tyre-flung crud, and making room for a large collector box to sit beneath the swingarm, while the end pipe then snakes its way through the swingarm up to a small end can. The petrol tank is clearly an early aluminium prototype, but it appears to be much larger than the one fitted to a 690. The little 390 engine only sips petrol, giving the Duke a theoretical 230-mile range on its 16-litre tank, so 300 miles between stops might not be out of the question on this Adventure model. The rest of the bodywork is clearly very early-stage, and in some places merely plastic sheet cable-tied to the subframe, which appears to be a steel trellis item, opening up the possibility of serious hard luggage. This, just like its bigger 790 Adventure sibling, in unlikely to be seen as a production bike until 2018. And while we’re a long way from getting a price, we’d expect it to cost a little more than the £4599 390 Duke. The other unknown and unconfirmed thing about this bike is that it could actually be a Husqvarna-destined model, rather than a KTM branded one.